Brain Dozier's original Big Train Souvenir Program bio. Brian Dozier (BT ’06) will make his major league debut as the starting shortstop for the Minnesota Twins against the Los Angeles Angels of Anaheim tonight, according to Twin’s manager Ron Gardenhire’s weekly radio show. Gardenhire said that the Twins needed some “offense” and “life” and that Dozier might be able to help the struggling franchise. Minnesota sits in last place in all of baseball with a record of 7-20. 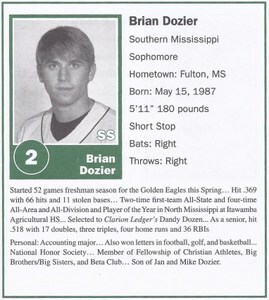 Dozier came to the Big Train after his freshman season at Southern Mississippi in 2006. Dozier played shortstop and pitched as the Big Train won the Cal Ripken League regular season title (28-12) by three games over the Rockville Express. Dozier hit .351/.424/.492 (AVG/OBP/SLG) with 13 home runs, 113 runs batted in, 146 runs, and 16 stolen bases in 162 games in his final three seasons at Southern Miss. The Twins drafted Dozier in the eighth round (252nd overall) in the 2009 MLB June Amateur Draft. After he was drafted, Dozier entered the Twins farm system and played almost 60 games in at the Rookie level in 2009. He played mostly with the Elizabethton Twins of the Appalachian League and was named the league’s All Star shortstop as he hit .353/.417/.431. In 2010, the Twins assigned Dozier to the Class-A Beloit Snappers. Dozier needed less than 40 games to prove his worth and was promoted to the High-A Fort Meyers Miracle where he was moved to third base. The move clearly didn’t phase Dozier as he was named the league’s All Star third baseman that season. Dozier started 2011 with Fort Meyers but was promoted less than 50 games later as he was hitting .322/.423/.472 and had stolen 13 bases. Now with the New Britain Rock Cats in Class-AA, Dozier’s bat started to really come alive. While maintaining his typical high averages (.318/.384/.502), Dozier hit 22 doubles, seven triples, and seven homers to go along with 11 steals in just under 80 games. The Twins decided to give Dozier a chance to make the major league roster in spring training of 2012. Though he wasn’t awarded a spot at the time, Dozier impressed many coaches. He was sent to the Class-AAA Rochester Redbirds where he got off to a blazing start before cooling down a bit. Dozier will be the seventh former Big Train player to make the majors. He joins John Maine (BT ’00), Bobby Livingston (BT ’01), Dirk Hayhurst (BT ’01), Steve Schmoll (BT ’00), Charlton Jimerson (BT ’99), and Michael McHenry (BT ’04). McHenry is the only other active former Big Train player in the majors. The Twins face the Angles tonight in a rare match-up. Jered Weaver will toe the rubber for the Angels in his second straight start against the Twins. Last Wednesday, Weaver no-hit the Twins while walking only one and striking out nine. This will be the first time in over a decade that a pitcher’s next start after a no-hitter will come against the team he no-hit. The only pitcher to ever throw back-to-back no-hitters was Johnny Vander Meer of the Cincinnati Reds in 1938.